Malocclusion is a condition characterized by having a poor bite or crooked teeth. It can be corrected by orthodontic treatment. 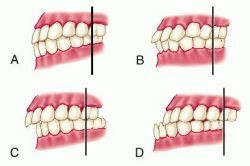 Specially trained dentist make use of various tools and techniques to treat this condition by moving teeth and the jaw to line them up correctly. Teeth having too little or too much space in the jaw cause this problem. Thumb-sucking, tooth loss and use of a pacifier are among the other causes of the condition. The most common symptom of this condition is crooked teeth or teeth that stick out. This condition can be mild or severe. Usually, people who have crooked teeth don’t like the way they look and want the condition to be cosmetically corrected. However, if severe, the condition can make it difficult to speak or eat. Normally, an experienced dentist at Brighton Implant Clinic looks for this condition in kids during regular dental checkups. In case the teeth or jaw is out of line, your dentist might suggest you to seek help from an orthodontist. Make sure to start scheduling regular dental checkups for your child at the age of 12 months as it will help detect any early oral health problems.